Competition sometimes results in companies using questionable tactics to protect their turf or gain market share. It’s the nature of the beast. The line is often fine between a great marketing concept and one that wasn’t such a good idea. Sometimes it’s just how it’s done that raises a red flag. Oftentimes it is one of those “sounded like a good idea at the time” sort of thing. Moreover, whoever said all is fair and love and war, should have also added in commercial competition. When dollars are involved, the gloves come off. Which, finally, brings me to the point. Last week ACR Electronics, who make 406 MHz EPIRBs and PLBs, went the FUD route in their ongoing competition with SPOT, which operates outside the traditional COSPAS-SARSAT distress alerting system. To make matters worse, this piece of FUD was issued shortly after I offered up on this blog my own “shot across the bow” to SPOT and other commercial distress alerting service in the works. Some folks, especially some who only read the introduction and viewed the PowerPoint presentation and didn’t listen to the audio of the presentation, have added 1+1 and come up with 3, somehow concluding that I’m saying the same thing ACR was (and the fact that I used this image (above right) to illustrate the traditional SAR vs. commercial distress alerting relationship probably didn’t help). As such, instead of getting caught up on the multi-page list of stuff I need to do this weekend, here I sit typing on this damn computer trying to set the record straight and clear up the FUD. First, to view ACR’s FUD media release, click here. Just remember when you read it, that it is just that, FUD. While you might get the initial impression that it was issued by the Coast Guard, it is, in fact, just another press release from ACR, which is clearly indicated by the quotations included from ACR officers and the statement at the bottom. In my opinion, it would have been far better to make this clear from the outset, but then, I’m not a fan of FUD to begin with. Technically and factually, the ACR release is correct. The conclusions that someone not familiar with either SPOT or how the Coast Guard works may come to from reading it may well not be correct at all. For a look at what SPOT is and how it works, please click here. It was written to imply that if someone were to send a distress alert from their SPOT device, somehow the Coast Guard is going to not take it as seriously as a distress alert from a PLB or EPIRB. “Not exactly!” as the popular advertising goes. If GEOS, SPOT’s contracted emergency call center, calls a Coast Guard RCC (Rescue Coordination Center) and delivers a distress alert, which will typically include a GPS derived location, the Coast Guard is going to act just as if it were a PLB or EPIRB distress alert. This SPOT distress alert clearly falls into the “Distress Phase” category, as outlined in the procedures mentioned in the release. In a case where a SPOT alert is provided without a location, it is still going to be taken seriously, but necessarily there becomes the question of where to search. In some such cases there might be a trail of bread crumbs, so to speak, from SPOT’s tracking capability. This may not be as good as a Doppler location from a 406 MHz beacon, but it will be enough to allow the Coast Guard to launch a search. Lumping SPOT with TracMe is another misleading part of the presentation. TracMe isn’t a distress alerting device. It is simply a homing beacon. The odds the Coast Guard would ever get an alert from someone from a TracMe beacon is down in the infinitesimally small range. In the unlikely case they did, they would be wise to be a little skeptical about it until they had more information to determine an appropriate response. SPOT is a distress alerting device using a commercial satellite system for alerting and a private commercial call center for notification. Two very different devices, deserving of different responses. I never met a watch stander for the Coast Guard who would ignore such an obvious and clearly presented distress alert as one coming from SPOT/GEOS, or even one from Uncle Joe who just knows Bob, who is cruising on his sailboat, didn’t check in as usual this morning. The fact that the Coast Guard has procedures in place to define how they treat calls shouldn’t be news to anyone; it’s how large organizations deal with things. They put in place generic procedures so that all involved operate the same and things, hopefully, don’t slip between the cracks. Bottom line, I’m not impressed with ACR’s issuance of this media release. I think it’s a classic case of FUD and I don’t think they need to resort to these sorts of questionable marketing ploys to sell a, from my point of view, clearly superior distress alerting product. If you are looking for a distress alerting device, in my opinion, you need a 406 MHz PLB, EPIRB or ELT. 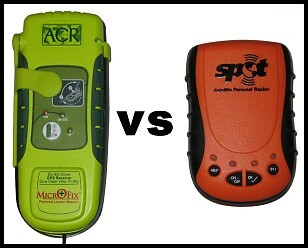 SPOT has some nice features, but isn’t as robust a distress alerting device at this point in its evolution. But, having said all that, it isn’t because the Coast Guard is not going to respond if they get a SPOT distress alert. Now, having hopefully gotten the FUD part of this discussion out of the way, let me make it clear that though I do have questions and concerns about with how SPOT/GEOS interfaces with the traditional SAR alerting network, and other issues with SPOT from a distress beacon and marketing standpoint, I never said nor implied that the Coast Guard wouldn’t take a SPOT distress notification seriously. I’m quite convinced, particularly after visiting GEOS last week (more on that at a later date), that they are quite capable of getting the message across in a professional manner, regardless of which SAR dispatching organization they deal with. Getting the distress alert to the right SAR dispatching organization at the onset (and I don’t believe that is an issue with the U.S. Coast Guard at this point) or even issuing one at all if a subscription lapses, may be an issue, and those are some of the many issues I was raising in my presentation. On a related, note, while my promised report on my actual experience in testing SPOT has been delayed by lack of time and other priorities, the folks over at BackpackingLight.com have done their own pretty thorough testing and evaluation of the SPOT and its performance and found it wanting in some respects. Their experience is somewhat similar to my own in this regard and their conclusions with regards its shortcomings also follow closely on my own. Unfortunately, the full report is only available with a subscription or purchase. My pleas to them to make their report publicly available have fallen on deaf ears, so this important safety information will not receive the wider reception it deserves. If you are considering purchasing a SPOT for use as a distress beacon, I suggest investing the $4.99 to gain access to the full report. My bottom line is simple. If you want to carry a SPOT because of the added features it offers, that’s great. It has a lot of nifty features. I believe that any distress alert from a SPOT will be taken seriously, though I question the robustness of that alerting capability and have other issues with the service and the device. At this point I am not willing to bet my life, or that of anyone I care about, on SPOT as a distress beacon of last resort. I’ll stick with my recommendation of 406 MHz beacons for that. And, now, I need to get back to that list, lest a certian person I am wedded to takes issue with me…. ACR FUD? was written on June 14, 2008 and filed in Gear.